Louisiana overflows with exotic taste experiences rooted in distinct, specific locales, unreproducible anywhere else. Think crawfish from the Atchafalaya Basin’s Belle River. Hansen’s Sno-Bliz in New Orleans. Blood boudin from Bourgeois Meat Market in Thibodaux. Andouille from Wayne Jacob’s Smokehouse near LaPlace. Isleño caldo soup from down Bayou Road in St. Bernard. 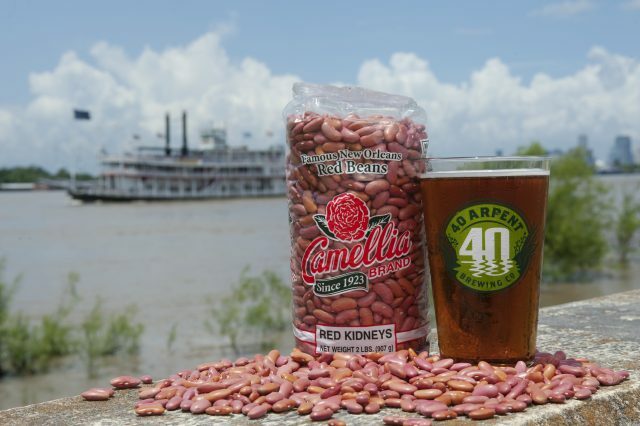 And also in St. Bernard Parish, there’s Red Bean Ale from 40 Arpent Brewery Co. in Old Arabi, right on the Mississippi River levee, overlooking the passing parade of cargo vessels, cruise ships, and the venerable riverboat Natchez. 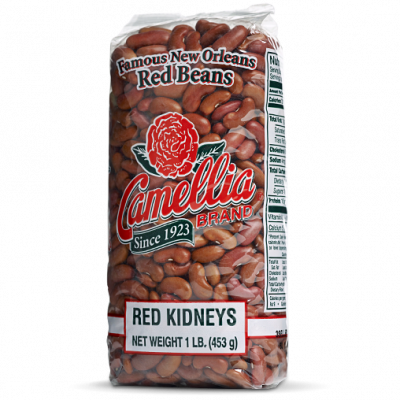 Red Bean Ale is the only beer in the world brewed with the primary ingredients of one of south Louisiana’s signature dishes, red beans and rice. And until distribution expands and plans to bottle the brew come to fruition, you’ll likely only find it on tap at select locations in southeast Louisiana, including the brewery itself, which holds Friday tastings from 5 to 7 p.m. at 6809 N. Peters St.
Go sample it for yourself there, practically under the shadow of the Domino Sugar refinery, just a cannon shot away from the historic site of the Battle of New Orleans. Currently housed in a spartan warehouse, 40 Arpent nevertheless is making waves for its brewing and business innovations: It just won the inaugural Startup St. Bernard competition, and the accompanying grant from the Meraux Foundation will help build a 1,000-square-foot taproom with a bar and deck, seating area, a stage for live music, and space for food trucks. How did founder and brewmaster Michael Naquin first envision using beans and rice in beer? The idea goes back to his early homebrewing days, when the Houma-born Naquin moved to New Orleans’ Mid-City neighborhood around 2000. Back then, the much-beloved, now-defunct Acadian Brewing Co. was firing on all cylinders on North Carrollton Avenue. Tippling sessions at Acadian inspired Naquin and his brother to invest in their own brewing equipment. 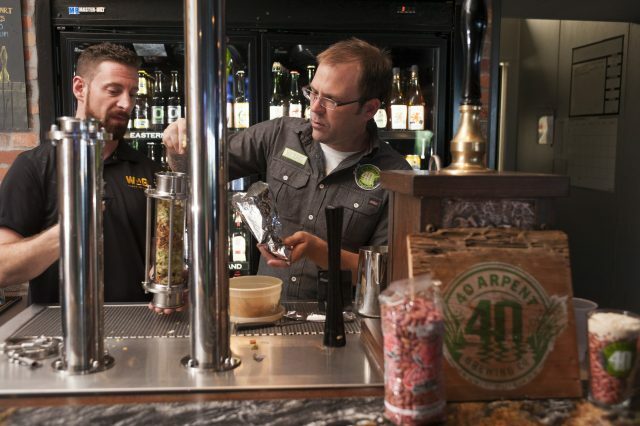 Realizing that his hobby was turning into a real passion with career potential, Naquin paid his dues apprenticing at breweries in Asheville, N.C., and New Orleans, including Zea Rotisserie & Grill and Crescent City Brewhouse. Naquin also taps another secret weapon for his beers: “The Father of Waters.” 40 Arpent uses high-quality municipal water from the Mississippi River, which it purifies even further by using a heavy filter. Naquin described the local water as “super hard,” a trait that leads to an “airier, drier finish” for 40 Arpent’s suds. In fact, Naquin credited the local water with helping distinguish his seasonal Duckwood IPA in particular from its West Coast and East Coast peers. Made with Cascade hops, the crisp, resiny result is what he called a true “Gulf Coast IPA.” “A little bitter” but with a fruity scent, it’s an “American-style ale” (5% alcohol by volume, or ABV) that enjoys wide appeal. 40 Arpent’s most high-profile brew is its year-round Milk Stout, which Naquin says is a major hit among coffee drinkers. The beer evokes cafe au lait, without the caffeine but with “a little chocolate.” Made with Mount Hood hops, the robust flavor comes from the roasted malt, while lactose conveys a hint of milk. Another seasonal 40 Arpent beer is the Delacroix Abbey Ale, named for the swampy Isleño fishing village in eastern St. Bernard that Bob Dylan name-drops in his 1974 tune “Tangled Up in Blue.” Offered around Lent, the golden-orange, Belgian-style ale boasts hints of peach and pear thanks to its fruity esters, while Styrian hops inject some spice and clove. Naquin has wryly nicknamed it “Delacroix Devil” in deference to its 7% ABV. So now you know the story of the Red Bean Ale’s creation. But how did Naquin set up shop in Arabi, just across the parish line from the Lower 9th Ward? Friends from the parish encouraged him to scout the area, and just a few years after Hurricane Katrina, Naquin liked what he saw. By chance he came across the family who owns Earl J. Doescher Co., an Arabi wholesaler of florist supplies and special-occasion gifts since 1958. Carl Doescher offered up a lot for lease, which Naquin accepted. A south Louisiana renaissance man of sorts, Naquin – besides brewing beer – had spent several years working in the refrigeration trade and also as a barber at a hair salon co-owned with his wife, Emily. Naquin was able to build most of the brewery’s physical plant himself, handling all the plumbing, electricity, refrigeration, Sheetrock, and sheet-metal work. “I pretty much did every single thing in here,” he said. His jack-of-all-trades nature allowed him to overcome basic construction hurdles that would have cost other nascent businesses a pretty penny. 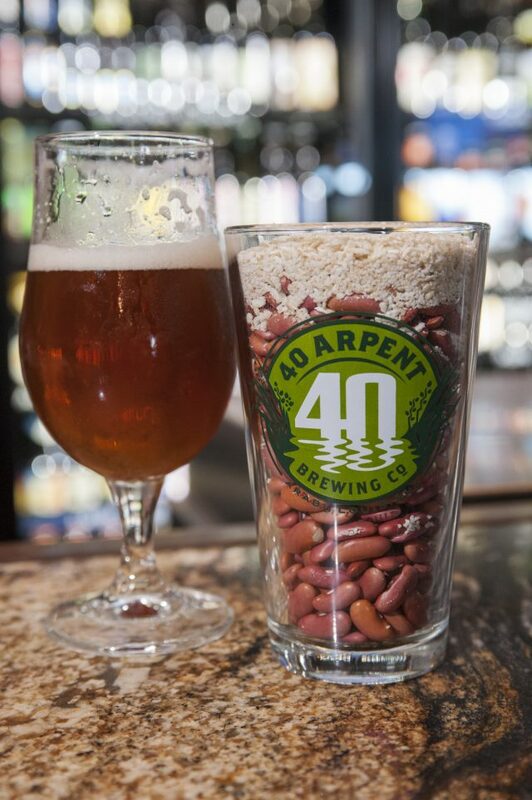 Why is the brewery named “40 Arpent”? It’s an old French unit of measurement prevalent during Louisiana’s colonial era, everywhere from Naquin’s old Houma stomping grounds to St. Bernard Parish. When St. Bernard was settled, land parcels facing the Mississippi had varying frontage widths but consistently ran 40 arpents back from the river. An arpent is about 192 feet, making 40 arpents about 1.45 miles. And in St. Bernard Parish, a drainage canal known as the 40 Arpent Canal runs along the old 40-arpent demarcation. Hence, “40 Arpent Brewery” is a tribute to both Louisiana’s French heritage as well as a salute to St. Bernard’s unique history, which saw both French and Canary Island (or Isleño) colonists settle in the area. 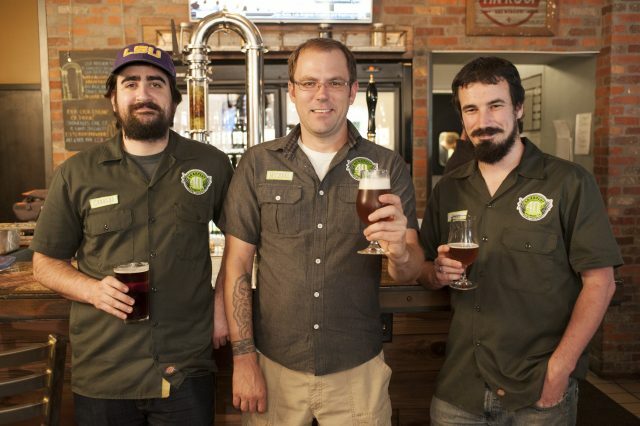 By combining the best of the past with a vision for the future, the brewery delivers delicious local flavors for beer lovers, and can be sampled at various locations around New Orleans, including Metairie’s World of Beer, which just hosted a festive launch party for the 2015 Red Bean Ale. The following list is by no means comprehensive but identifies many venues that have recently served 40 Arpent brews, such as: in St. Bernard Parish, the Old Arabi Bar, within spitting distance of the brewery itself; in New Orleans, Ale on Oak, Avenue Pub, The Bulldog, Uptown, The Bulldog, Mid-City, Cooter Browns, the Hyatt French Quarter, J&J’s Sports Lounge, Jax Brewery Bar, Junction, Spitfire, Toups’ Meatery, Three Muses, and Tujague’s Restaurant; in Jefferson Parish, Lager’s in Metairie; in Baton Rouge, Beausoleil Restaurant and Bar, Boudreaux and Thibodeaux’s, and The Chimes; and in St. Tammany Parish, The Chimes in Covington. Throwing a red-beans-and-rice house party? Order your very own mini-keg from Elio’s Wine Warehouse in Uptown New Orleans!